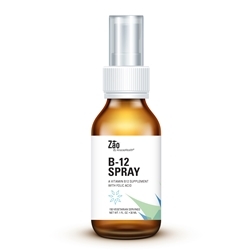 Zao® B-12 Spray combines 1000 mcg Vitamin B-12 with the ctive form of Vitamin B-6 and folic acid in and easy to use spray. Suggested Use: As a dietary supplement, hold nozzle 1" from mouth, spray once and swallow. Use once daily or as directed by your healthcare practitioner. Supplement Facts: Serving Size 1 Spray (0.2 mL) Amount Per Serving: Folic Acid 100 mcg Vitamina B-6 2 mg (as Pyridoxal 5-Phosphate) Vitamin B-12 1,000 mcg (as Methylcobalamin & Hydroxocobalamin) Other ingredients: glycerin, water.